The Levels singer, who released his first album at the age of 11, will receive the Hal David Starlight Award. This honour is given to those who have made a significant impact on the music industry through original songs. Nick, 23, will follow in the footsteps of Taylor Swift, John Legend, Alicia Keys, Ne-Yo and John Mayer when he is given the honour at the 47th Annual Induction and Awards Dinner in New York on 9 June (16). 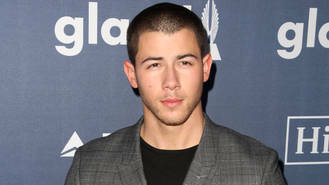 "Nick Jonas is one of the brightest and most versatile young talents on the American pop scene," Songwriters Hall of Fame co-chairs Kenneth Gamble and Leon Huff tell People.com. "A veteran of recording, television, movies and Broadway success... he has been making his cultural mark in a variety of ways for more than a decade. Nick has literally grown up in public, and that growth is reflected in his songwriting and singing. He is a wonderful choice for the Songwriters Hall of Fame’s Hal David Starlight Award," they explained. Lionel Richie will receive the highest honour, the Johnny Mercer Award, during the ceremony at the Marriott Marquis Hotel, while Elvis Costello, Tom Petty, Nile Rodgers and Chip Taylor will be inducted into the Hall of Fame. Marvin Gaye and Nile's late Chic bandmate Bernard Edwards will be inducted posthumously. The dinner takes place the day before Nick's next album Last Year Was Complicated is released on 10 June (16). He told fans on Twitter that he wrote songs about his break-up from model Olivia Culpo on the record. "S**t is too real sometimes... Reliving some of these real life experiences through this music is hard... But I know it's important that I do it. I want to be an open book in my art." The former couple split in 2015 after two years together.